We ploughed the fields and scattered in Rathkeale last night … or at least sang about it, and scattered the funds we raised to help the victims of the recent earthquake and tsunami in Indonesia. 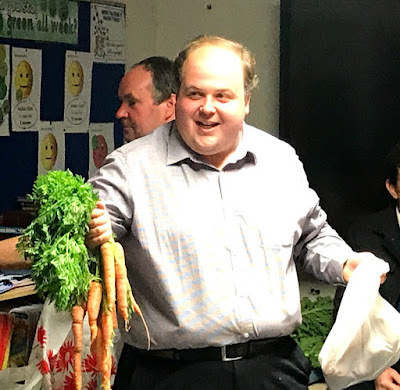 We celebrated the harvest, sang about it, prayed about, listened to God’s word about it, heard from our visiting preacher, and then enjoyed it as we sold and bought the produce of the harvest at the auction in the school. 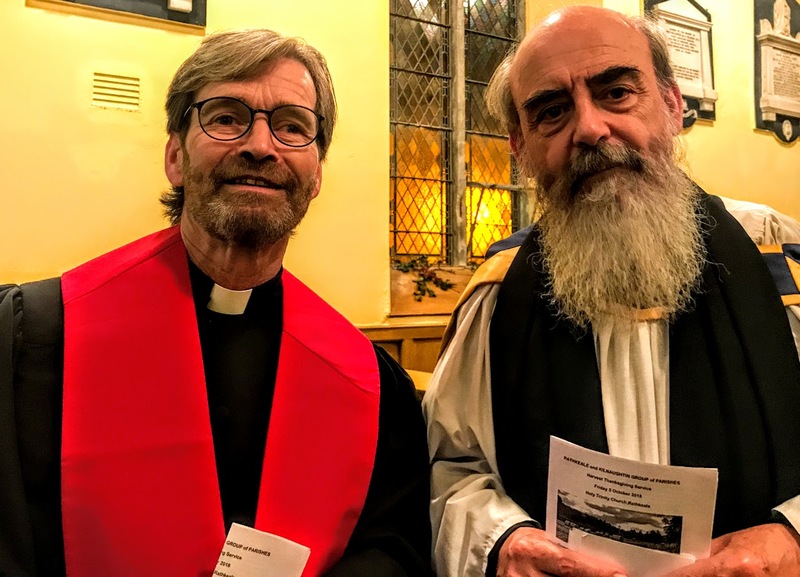 This year it was the turn of Holy Trinity Church in Rathkeale to host the group harvest service, and there was a large number of visitors there too from local walking groups. The visiting preacher was the Revd Michael O’Sullivan of Cork Unitarian Church, who studied theology at Maynooth and the Priory Institute. This was not his first visit to Rathkeale: he had been here last year during the Palatine conference, and joined us in the school for coffee. Mike, who was ordained in the Non-Subscribing Presbyterian Church last year, is a long-time friend on Facebook, and a frequent contributor to debates I have stirred on social media. His church on Prince’s Street in the heart of the city centre is listed as the oldest place of continuous worship in Cork, having been opened as a church over 300 years ago in August 1717. Building began around 1711 in an area outside the then city walls called Dunscombe’s Marsh. It was built to house a Non-Subscribing Presbyterian congregation that had outgrown a smaller church in what was then Watergate Lane, now South Main Street. The church opened on 4 August 1717, and Prince’s Street is now a well-loved area of Cork, close to the English Market, as Mike told us last night. The Non-Subscribers were dissenters who eventually broke with the Presbyterians over the question ministers subscribing to the Westminster Confession of Faith. Former ministers in the church include the Revd Thomas Dix Hincks (1767-1857), founder of the Royal Cork Institute, and famous members of the church include Richard Dowden (1794-1861), a Mayor of Cork and the painter Daniel Maclise (1806-1870). The Temperance campaigner, Father Theobald Matthew, signed his Temperance Agreement in the Unitarian Church in Cork in 1839, and six years later the American social reformer, abolitionist, author and statesman Frederic Douglass visited the church. In the 20th century, numbers began to dwindle and by 1955, with just one remaining member, plans were made to sell the church. The church has found new life in recent years, and the building was restored in recent years. The Revd Mike O’Sullivan, who was ordained in February 2017, and the church celebrated its tercentenary in September 2017, attended by the Deputy Lord Mayor of Cork, clergy from the Synod of Munster, ecumenical guests, and the Choral Con Fusion choir. The church has good ecumenical relationships with neighbouring churches and other faith communities in the area, and the pulpit was a gift from the Church of Ireland. Back in Rathkeale No 2 National School after the Harvest Thanksgiving Service, the Harvest Auction was conducted by the ever-affable Councillor Adam Teskey. The funds raised last night are going to the Church of Ireland Bishops’ Appeal Fund to help responses to the earthquake that hit the island of Sulawesi last week, causing a tsunami and around 170 aftershocks. This is the most devastating earthquake to hit Indonesia since 2004, and Bishops’ Appeal is acting as a conduit for funds that are being directed to agencies to aid emergency relief efforts on the ground. Castletroy is a busy and bustling suburb on the edges of Limerick. The University of Limerick is nearby, so there is a large number of students there. But Castletroy includes hotels, a cinema, shopping centres, a golf club, schools, the former Church of Ireland parish church in Kilmurry, now the home of Kilmurry Church Arts and Cultural Project, and Limerick’s restored Jewish cemetery. Nearby, there are walks along the banks of the River Shannon and the River Mulcair. 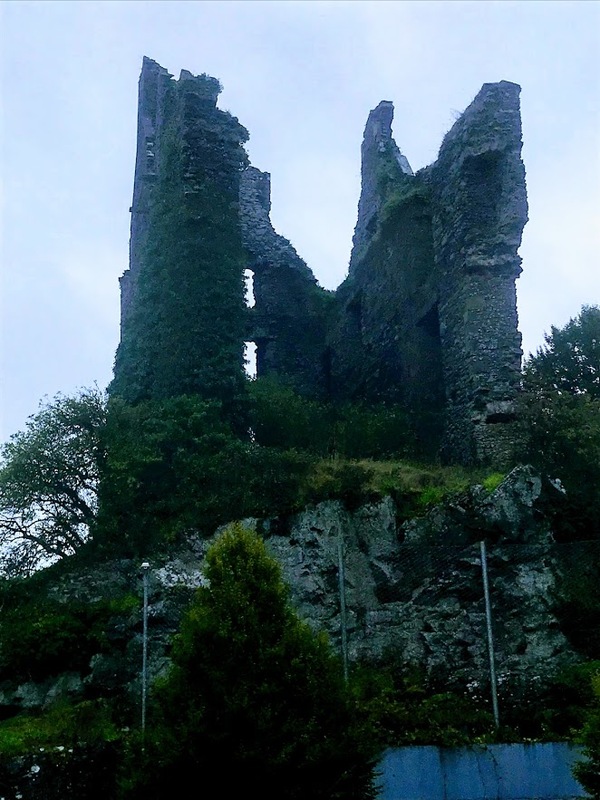 But one of the landmarks that most people notice as they travel through Castletroy on the road into Limerick are the ruins of a castle, sometimes known as Castle Troy or the Black Castle, built in the 13th century by the O’Brien family. I was in Castletroy earlier this week for a number of church committee meetings and lunch, and was surprised to realise that Castletroy does not take its name from this castle. The original name in Irish is Caladh an Treoigh, meaning Troy’s Landing or Troy’s Quay. Nor does the name have any connection with Homer’s Troy or with the Iliad and the Odyssey. Instead it is suggested that name originates with the O Turrain clan. They may have used the area as a safe harbour for navigating the river, but they had no connections with the area by the time the castle was built. The castle at Castletroy, sometimes known as Black Castle, was first built by the O’Brien family to guard the border of their territory with the Anglo-Normans, who had built King John’s Castle in Limerick. The castle passed the MacKeogh clan, who claimed descent from Fergus Mac Roich, former King of Ulster who conspired with Maedbh of Connacht in the Tain. But it is not clear whether they acquired the castle from the O’Briens through marriage or alliance, purchase or war. But a spear has been thrust thro’ the breast of his daughter. Later, the MacKeogh castle was taken by the FitzGeralds, Earls of Desmond. 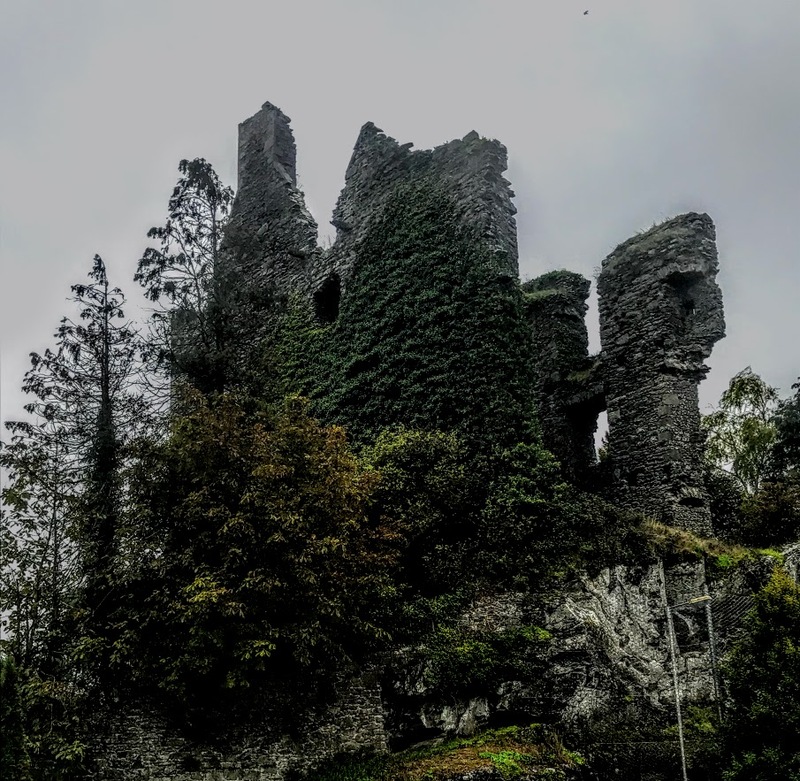 When Gerald FitzGerald was killed in 1582 during the Desmond Wars, his lands were divided and Castle Troy became the property of Sir John Bourke (1550-1607) of Brittas Castle, about 15 km south-east of Limerick. Bourke was a Catholic sympathiser and openly attended Mass. When he was arrested, his release was secured by his father-in-law, Sir George Thornton managed to secure his release. Eventually, he was hanged at Gallows Green in Limerick on 20 December 1607. His property, including Castle Troy, was handed to his rival kinsman Theobald Burke of Castleconnell, who became 1st Baron Brittas in 1618. The Cromwellian general Henry Ireton besieged Limerick in 1650, but was forced to call off his siege with the onset of winter. He returned the next year, and realising that Castle Troy was in an ideal positioned to defend the city against forces moving down the River Shannon, he destroyed the castle in 1651 with cannon set up on Harty’s Hill. Theobald Bourke of Brittas lived on until 1654. But the Bourke estates were given in 1666 to James Duke of York, brother of Charles II and later James II. If the castle was ever restored, it was certainly put beyond repair during the Williamite wars in 1690. After the last siege of Limerick, the castle was dismantled and blown up, along with other castles that defended the passes to the city, the Bourkes lost their Brittas and Castleconnell titles, and the land on which the Black Castle sat was later bought up by the Hollow Sword Blade Company. On the red, feudal days when Green Eire was a Nation. Plough’d their strong castle walls on the brink of the Shannon.